When I got home from work on Thursday, this was on my doorstep! 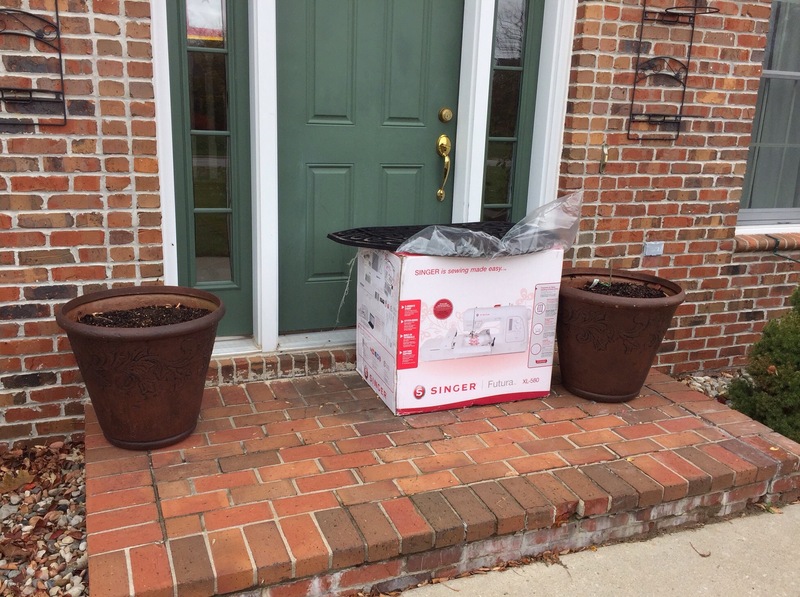 It seems that my hubby has been doing some online shopping while I was away! 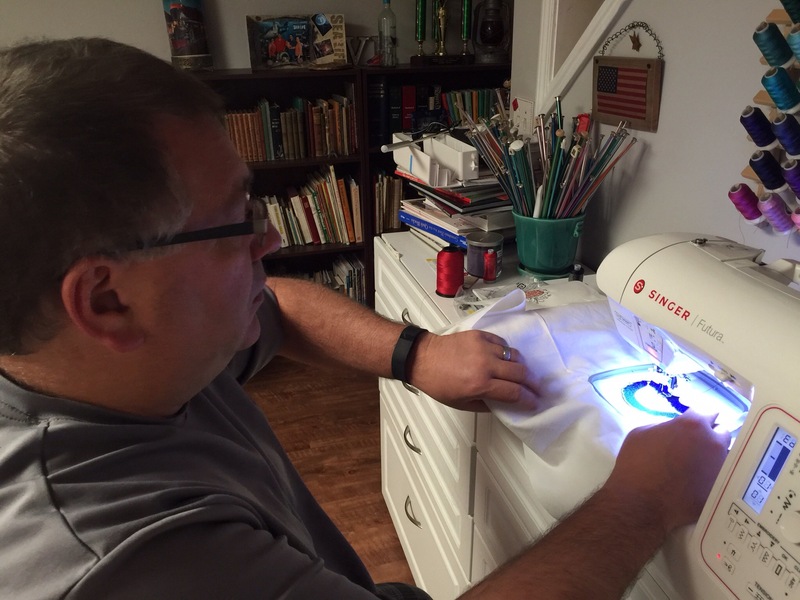 I have a Singer CE-200 embroidery machine that he bought me for Christmas a number of years ago. He was rather intrigued and asked me to show him how to use it before I left on my trip. While using it, he decided that I needed an upgrade. So here is a Singer XL-580. And yes, there is a definite difference in both the software and the machine. Here is Mr. Wonderful trying out the new machine. This machine comes with some digitizing software called Auto Punch. 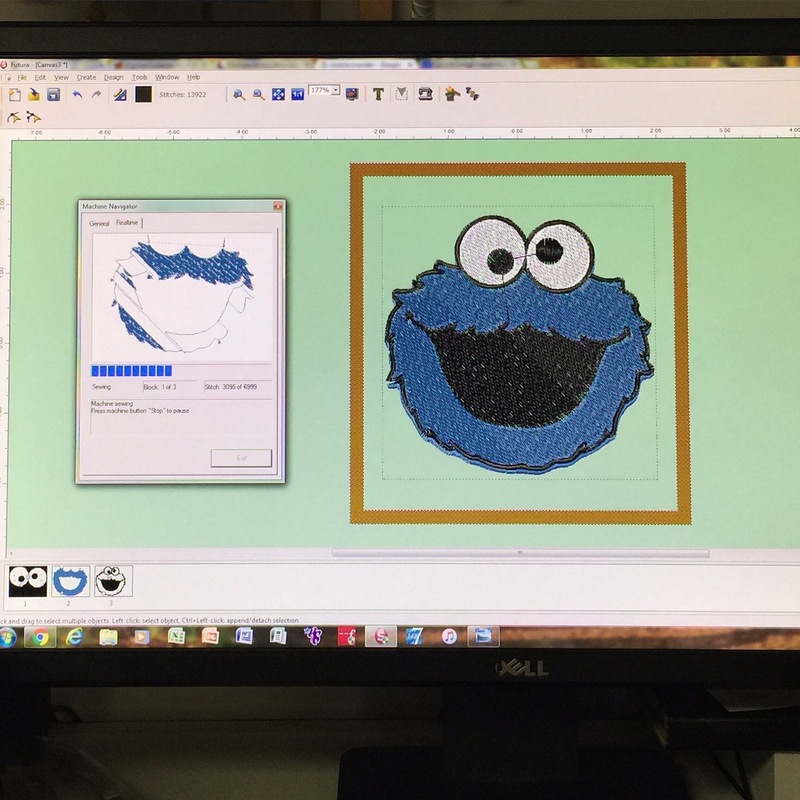 We found a Cookie Monster image online and digitized it using Auto Punch. At one point, we removed the hoop and put it back in and I think that is why there is some misalignment. With a little bit of work, this could be a fun, useable design. I have to work this morning. I can’t wait to come home and see what else he has learned. He is way ahead of me at this point! Maybe this machine was for him and not me? I’m good with that! This entry was posted in Machine Embroidery, Uncategorized. Bookmark the permalink. 10 Responses to Embroidery Anyone? Fun, fun, fun! Enjoy learning your new machine, if you’re allowed to get near it. One reason for the misalignment could be not enough stabilization, or too dense a design for the fabric type. I second the suggestion of marking pens to fill in the gaps when necessary. Oh yeah, let your husband become the embroiderer! I’d love to have somebody – in house would be fantastic, but in town would suffice – who would embroider labels and the occasional other random design for me! But otherwise, I’m too busy quilting! What a fun way to spend time together! I encountered a few gaps where the outline meets the design too when I was digitizing years ago. I just filled in with permanent marking pens and most people would never notice any problems. Have fun with the machine. 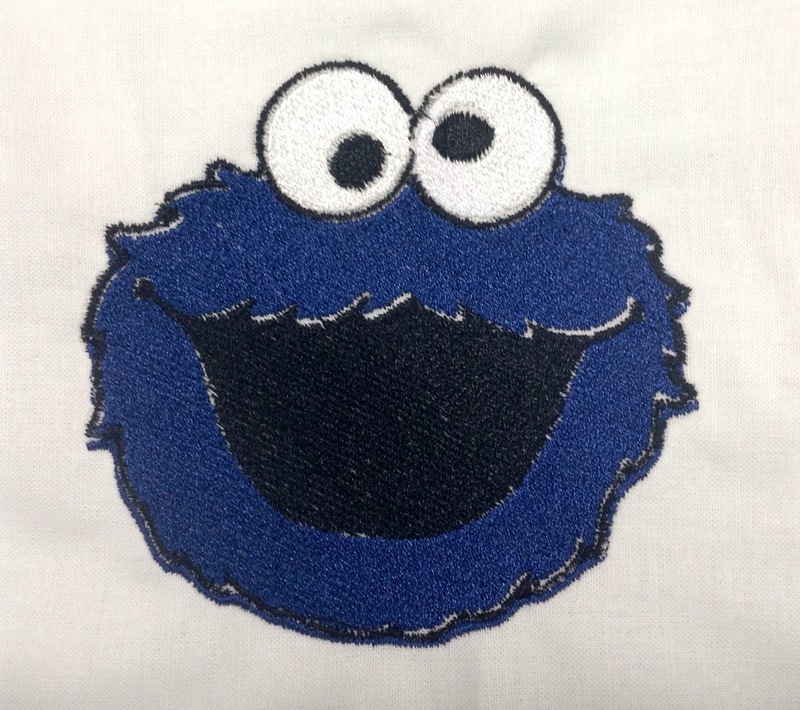 I really need to get back to mine……I certainly have enough designs to embroider. Oooooo Katy! This is awesome! Isn’t nice to have a hubby who gets it?!? I’m so excited for you!!!! 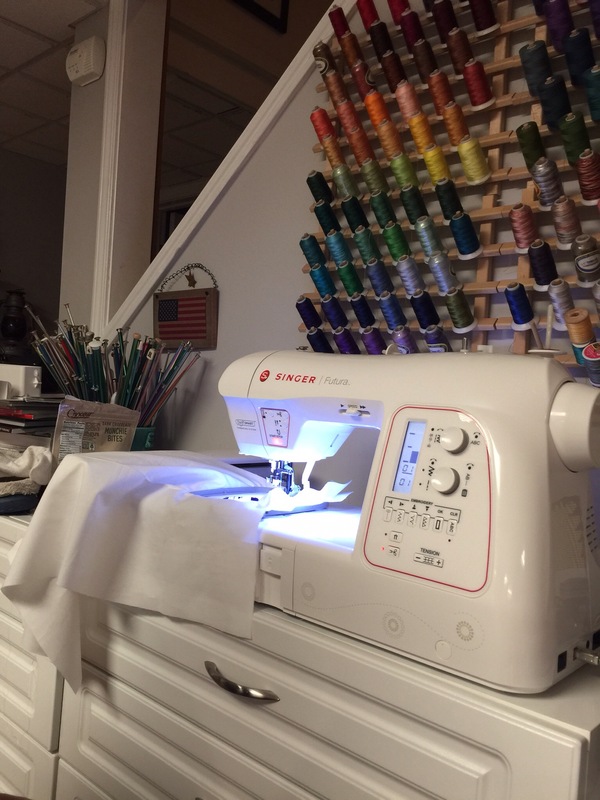 Quilters know that sewing machines are actually power tools in disguise. Have fun with your new power tool!